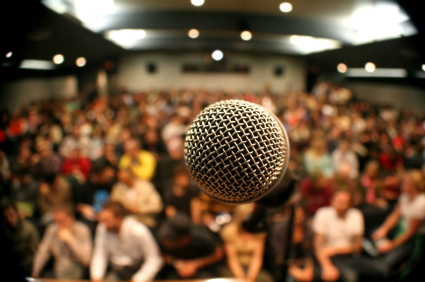 6 Things That Can Help You Overcome Presentation Jitters. I have been doing public speaking for the better part of the past 3 years and the prospect of speaking to a group of people still scares me. No matter how prepared I am or how well I know the audience, I find my myself a nervous wreck hours before the actual presentation. So what can one do to really get rid of these pre-presentation jitters? George Jessel once said “The human brain starts working the moment you are born and never stops until you stand up to speak in public.” How true. But there is hope. As nervous as I get before presentations, I have done the following few things to help calm my nerves. They don’t remove the fear entirely but it gets a little better with practice. Your mileage may defer. Stop changing at the last minute. Commit to your material. Trust that you have already done the necessary research and that the rest can be added on the fly as a you speak. Probably not for the first run but if you have spoken on a topic once before, resist the temptation to “update”. Stick to it for a few more runs so that your new additions will not disrupt the flow of your presentation. Sit down and mingle with the audience 10 minutes before. I started to doing this by accident 2 years ago. Happened at a workshop where there were a few early attendees. Oddly, they were trying out different seats and out of curiosity, I asked them what they were looking for and it quickly turned into a chat on how cold the air-cons in Singapore were and how people were getting sick and before we realized it, we were talking about online behaviors and moving closer to the topic of the workshop. Later, I used that conversation as a lead-in. It was something they could relate to and the rest of the session just flowed nicely. Start talking to the audience as you are setting up. I find myself having to do the audio/visual set up myself sometimes and they turn out to be good opportunities to banter with the audience. I think it is seeing a fellow man wrestle with common IT issues that get them to relate to me better but the ice broke away and the audience warmed up quickly. But be careful not to over do this. Protracted technical issues make you look unprepared and may lose you a few hard-earned brownie points. Do a quick lap around the room. This is an old trick. You need all your faculties working at optimal level so start your heart pumping. Unlike the heart palpitations from stage fright, this kind of heart workout gets your entire body working and makes you more alert and naturally more confident to take on the world, starting with the immediate presentation. Answer a few questions at the beginning. Instead of polling your audience to get you into the swing of things, try getting them to ask you questions instead. I know this is counter the tradition of having Q and As at the end but I find that people naturally like to answer questions more than giving speeches so the more you answer, the more embolden you may be for the speaking session.